"You Will Be My Son" subtly transforms from one genre to another the way an exquisite, complex wine teases the nose before finishing strongly on the palate. 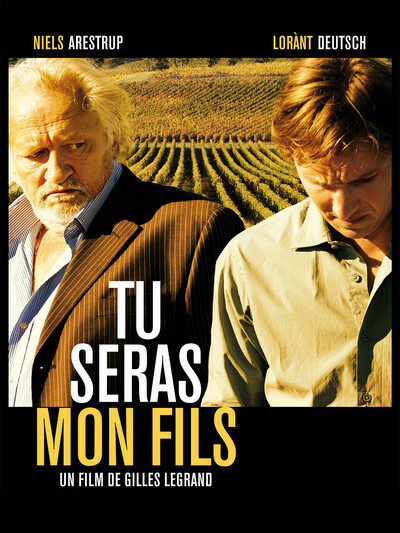 French director and co-writer Gilles Legrand shows great mastery of tone and pacing in his third feature, which begins life as a domestic drama set at a family-owned vineyard and slowly morphs into a tense thriller. Certainly a sense of foreboding is present from the start. Death appears everywhere, early and often, from the stark opening image of a coffin entering a crematorium to the daily discarding of grapes that don't make the grade. Ghosts from the preceding eleven generations that have owned and operated this slab of Saint-Emilion land seem to hover about the place, lending a feeling of weight and importance. This isn't just wine they're making but history, which makes the characters' choices for the future that much more significant. At its core, though, Legrand's film is about a father and son—or, rather, about two fathers and two sons, and the power of passing down a legacy. The great Niels Arestrup gives a commanding performance as Paul de Marseul, the respected veteran winemaker in charge of the estate. His offerings are renowned worldwide for their quality, thanks in large part to a 40-year partnership he's had with his solid and quietly loyal vineyard manager, François (Patrick Chesnais). But when Paul learns that François is suffering from pancreatic cancer and doesn't have much longer, he must make plans to continue the operation. It seems natural that Paul would pass along François' responsibilities to his own son, Martin (Lorànt Deutsch), but it's clear from the first time we see them interact that Paul has nothing but disdain for his only child. As elegant and charming as Paul can be in schmoozing up a journalist who's writing a piece on the vineyard, he can be just as cruel and critical toward his son, never passing up the opportunity to get in his petty digs. Martin seems quite capable of running the administrative side of the business, and he has a happy marriage with the beautiful and strong Alice (Anne Marivin). But he's a little mousy, his lean runner's frame providing symbolic contrast with the heft of his wide and white-haired father. Martin is eager to step up, but Paul is determined to keep him down, supposedly because he feels Martin lacks the keen nose and palate to be an expert winemaker. In this lush setting of golden skies and rolling hills, Legrand slowly and steadily ratchets up the suspense. Every slight, real and perceived, incenses Martin further as it becomes obvious that Philippe is his father's heir apparent. The fact that he and Philippe were childhood friends growing up together on the family estate magnifies his anger and resentment. Alice's indignation and protective nature add to the tension. Some of the sharpest scenes in "You Will Be My Son" (which Legrand co-wrote with Delphine de Vigand) are the ones between Alice and Paul, as he regards his daughter-in-law with not just condescension but also sexism. (Marivin is as fierce as she is beautiful.) At the same time, Francois also becomes mistrustful of Paul's intentions after decades of stoic service to this man. It's the stuff of Greek tragedy, especially with the formidable Arestrup's towering presence at its center. Paul is clearly a terrible human being—selfish and soulless—but his bad behavior also provides a streak of dark humor. Armand Amar's dramatic classical score adds to the feeling of gravitas. But Legrand keeps the proceedings from turning too soapy or self-serious, simply because the setting is so refined and the performances are so nuanced. The director also clearly loves wine himself. He takes great care to make the texture of the soil seem tangible, and to show the rich hue of an especially spectacular bottle that's been pulled with pride from the cellar. You'll undoubtedly be inspired to pour yourself a glass (or two) afterward.